Over the past few days i've been very fortunate to have had the opportunity to experience some simply amazing events and be surrounded by some amazing people. 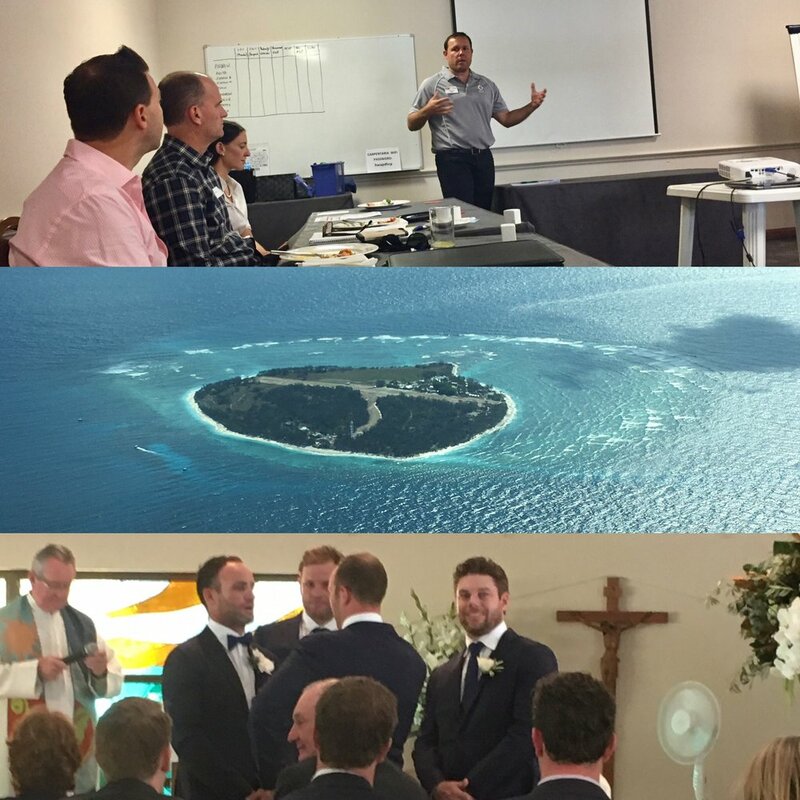 From leading a training session for a group of business owners who wanted to create growth, to a close friend's wedding, to coaching our first rugby trial and then swimming with turtles, sharks, eels and baby manta rays at the Lady Elliot Island Eco Resort (www.ladyelliot.com.au).... it's been an exceptional past few days. During all of these activities there were moments where people were faced with fear, and it was interesting to see how they handled it. During the training session there was a business owner who found it very challenging to stand up in front of a room and speak. When I mentioned that "Fear and Gratitude can't co-exist, so think of the value you are adding to the room rather than how you are feeling yourself"... he slowed down and felt more at ease. Fast forward to Friday evening and I am standing next to a great mate who is about to deliver his wedding speech... now here is someone who would wrestle a bull with his bare hands, yet stand up in front of a room and deliver a speech he was NERVOUS. "You know Fear and Gratitude can't co-exist, so think about how much it means to have all these people in the room rather than how you are feeling yourself... he slowed down and felt more at ease. Then yesterday I was snorkelling off Lady Elliot Island and along swims a breed of shark... yes a 2.5m shark swimming along the bottom of the sea bed. What came in to my mind first... of course Jaws, attacks on surfers and the like. I then reminded myself of my own words "Fear and Gratitude can't co-exist", so then chose to look around and appreciate the turtle who had just swam past and the fact I was snorkelling on one of the 7 Wonders of the World being The Great Barrier Reef for the first time... it helped calm the heart rate. So in all of these situations, the outcome would have been extremely different without knowing about our little concept. The presentation wouldn't have resonated as much, the groom's speech wouldn't have made his mum cry as much and I would have splashed about and probably attracted more of the shark's attention. So when you find yourselves in situations that involve you being fearful, remember our little concept that "Fear and Gratitude can't co-exist" and be grateful for the things you have rather than thinking the worst about things that may never actually happen. Have an awesome week and let me know how you are getting on and if there is anything you would like to hear about.